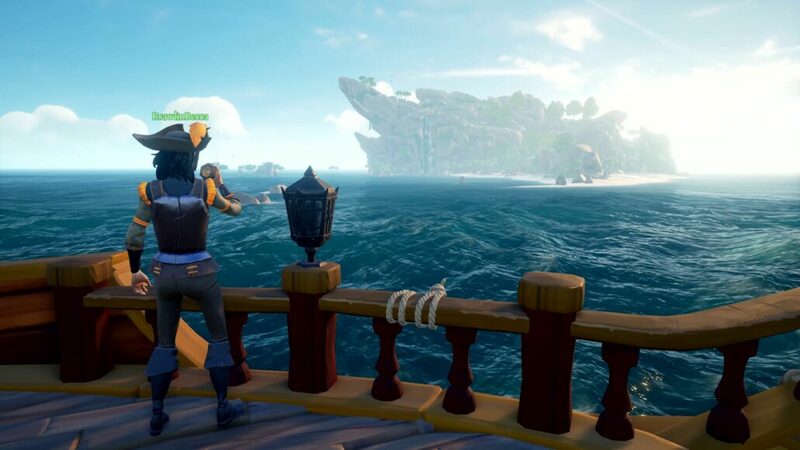 With Rare’s Sea of Thieves, we have decided to embark on a review experiment here at Wccftech. The game’s intrinsic sandbox nature and focus on cooperative action suggested a different approach, so we chose to deploy a crew of four pirates on the seas and then let them recount their own experiences while adventuring in this curious world. As you’d easily guess, our final score will be the average of the individual scores. The social seas are something to be explored with a full crew, as Sea of Thieves just doesn’t capture that same magic when sailing solo. 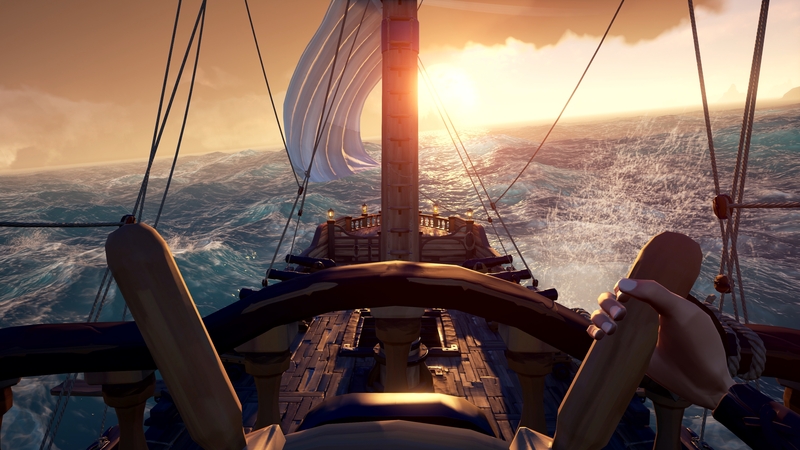 Rare has done a phenomenal job creating a world that gives crews an open-sea sandbox to explore at their own pace. 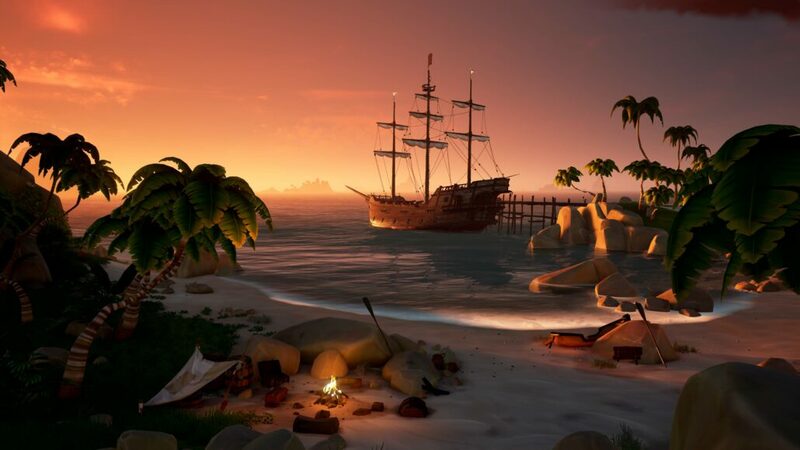 Long stretches of the open sea feel barren, although finding an enemy ship or skeleton fort can quickly lead to exciting and the moments of Sea of Thieves that are worth sticking through to see. Pockets of adventure can be found in any direction of the compass, so if heading due north doesn’t lead to booty, change your bearings and head west instead. Those seas can lead to adventure just as quickly as boredom, however. There’s a startlingly low amount of content to discover on the open waters. What is there to explore walks the gangplank between fantastically designed treasure hunts and wreckage and islands as empty as the treasure chests hidden within. All too often, the quest for booty falls flat, leading to little more than bananas or something of modest monetary value. On the other hand, some of the more elaborate quests lead to loot just as memorable as the quest itself. Sea of Thieves shines like a glittering golden tooth when a crew sails together on the high seas. As a player that doesn’t always play with a full crew, my time with Sea of Thieves left something to be desired. What’s there for a single player to enjoy isn’t worth the purchase, but the times I spent together with like-minded sailors felt great, although still a little sparse. The open seas could use a grander sense of adventure, so perhaps we’ll see Rare support Sea of Thieves with enough new content to call me back. The clue is in the title, the best part of Sea of Thieves is the water and those that sail upon it. I’ve sent two full days voyaging across the high seas and with that comes some amazing stories, but also some moments of undiluted boredom. While island hopping across the great sea doesn’t take more than a few minutes, there can be surprisingly little to do. Unless you happen to bump into another player, a storm or the infamous Kraken, your biggest challenge is simply staying on course. Right now, the reason to return to the waves is to collect more of those stories, not whatever the game offers. The ability to craft your own tales feels like a true sandbox. Your amusement is not bound to quests, in fact it often comes despite the objectives, not because of them. But with that comes a lingering fear. Sea of Thieves is a game designed to let players have fun by themselves. All the systems are there to be toyed with and exploited and the game can take a back seat and let the players do what they like. If Sea of Thieves cannot sustain its player base, the game will quickly lose its charm. And there are a few issues that could put players off. Griefing seems like an issue the developers are going to have to retune and balance frequently. While it’s all well and good letting players do what they want for the most part, being spawn camped by another team becomes tedious very quickly. Meanwhile, the game controlled enemies are a poor imitation of the players, offering little tension or excitement as you explore the tropical islands. Even the astoundingly beautiful water doesn’t make up for the long pauses between action. And it actually astounding. I haven’t seen water in a game look that gorgeous before. The actual sea doesn’t look as nice as the waves lapping at your bow in Sea of Thieves. Sea of Thieves is a rough diamond right now. But I trust Rare’s roadmap to create a more inclusive, evolving experience that can offer more sustainable, game led thrills. Right now it is one of the best experiences I’ve had this year, but whether it can maintain that is still a matter of opinion. The high-speed pursuits across the waves, the Jack Sparrow-esque highjackings and the epic battles with rival crews are wonderous, spectacular and memorable moments. All we need is a hook to keep everyone coming back. Living life as a pirate sounds like it would make for a pretty cool game, right? Explore exotic islands, unearth hidden treasures, discover new regions and sunken ships… nah. How about you do the same three quests over and over again until you get bored. That would be so much better, well, at least the developer thinks so. The bulk of your time playing Sea of Thieves will revolve around completing three different types of quests. The Gold Hoarders quest line sends you out in search of buried treasure, while the Order of Souls quests will require you to take out a skeleton captain and crew. Finally, the Merchant Alliance quests depend on you locating and capturing various animals, including chickens and pigs. While these quests are fun to work through at first, it’s not long before they begin to feel stale. I found that I was heading back to the same islands far too quickly, despite the vastness of the world map, and repeating the same style quests each time with only a few tiny alterations soon felt boring. Thanks to the pitiful rewards that you’ll receive when handing in your loot at the Trading Posts, and the potential to lose everything to other players, it hardly feels worth the grind. The fact that gold can only buy you cosmetic items also makes the entire process seem a bit pointless. 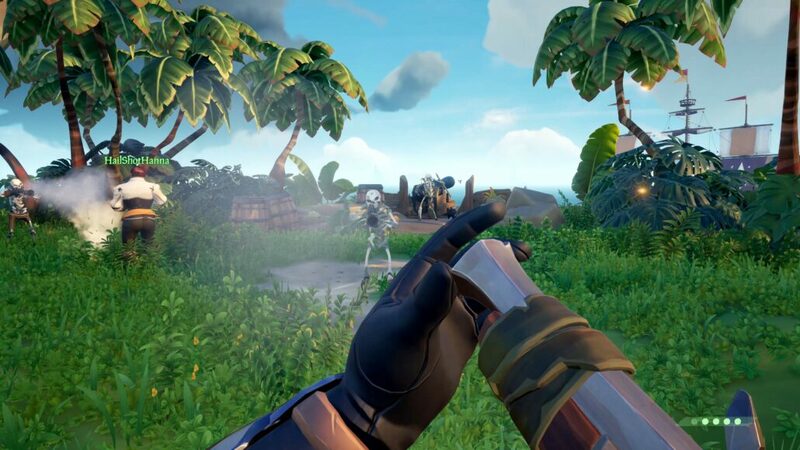 Ideally, Sea of Thieves would have come with a second copy of the game to ensure you have a friend to play with. Playing this game as a solo experience is one of the worst experiences you can have in gaming as everything is designed with cooperative play in mind. You are also putting yourself at a huge disadvantage if you don’t have three friends to play. No matter how good you and your partner may be in your sloop, a four-person galleon will almost always be able to take you down with ease. The Player vs Player (PvP) combat is as shallow and unrewarding as the rest of the game. With the combat being reduced to simply clicking on other players when you have your sword equipped, or firing cannonballs from your ship, there’s not much in terms of strategy or skill to think about. The rewards from the PvP come from the treasure that you may be able to loot from other ships that you find on the sea. Unfortunately, stealing that treasure means you will have to spoil potentially hours of work of those other players. Rare have created a system that better rewards players for pillaging other ships than they have for actually playing the quests they created. Sea of Thieves plays more like an early access title than a retail game. Normally this wouldn’t be too much of a problem, except for the fact that the game costs the same price as a high quality title. This is unacceptable for what you are actually getting in terms of content. For this price, players should not have to resort to creating their own fun in the sandbox Rare has made. Sea of Thieves is a huge grind with very little payoff, avoid it unless you happen to find it for a very cheap price. Let’s not mince words: Sea of Thieves has been a huge risk for Rare, a game studio that never really dived much into multiplayer throughout its long history. To envision an online-only game that subverts many, if not all, the established tropes of the genre is commendable in and of itself. Now that the game is out, though, the question is whether throwing out decades of online gaming staples turned out to be the right choice. Unfortunately, it didn’t, at least not in this case. The fundamental irony is that Rare chose to cast aside the first and foremost basic principle of piracy: amassing riches. Yes, you do go around seeking treasures and possibly stealing them from other players, but you can’t actually do anything meaningful with your precious loot save for cosmetic customization of both your character and ship. That’s because Sea of Thieves doesn’t feature any kind of real progression and therefore anything to look forward to. The developers have pushed the notion that the adventure itself should be the goal and there’s certainly some truth to this concept (although I remain convinced that a “shared world”, or MMO-like, game should indeed be supported by a deep progression system). However, the problem is that there really aren’t that many thrilling adventures to be had in Sea of Thieves for now. Most of the islands currently featured in the game are basically empty save for a few skeletons, snakes and occasionally some pigs. As a whole, the world is incomprehensibly lacking when it comes to interesting content and Rare’s decision to keep NPC ships out of the game is baffling, to say the least. In addition that, on foot combat (both melee and ranged) is just too simple to be exciting. On the other hand, ship combat is probably too complex as hitting another ship with a cannonball is something of a miracle; most of the time, engagements between ships on the open sea simply result in a lengthy flurry of missed shots until one or both of them get bored and simply head off the other way. That doesn’t mean they got everything wrong. The graphics are stunning, to say the least, on Windows 10 PC and Xbox One X thanks to a charming art style and possibly the best water rendering technology ever seen in games. If you’ve got a High Dynamic Range (HDR) display, Sea of Thieves also features one of the best implementations witnessed in games yet. The game can also be fun when you first play with a party of friends, generating a cooperative spirit and a bunch of good laughs among crewmates, but this may be due more to playing with friends than to the game itself; in fact, fatigue and boredom quickly kick in upon realization of the widespread shallowness of Sea of Thieves. There’s certainly room for Rare to add at least some of the missing features and content that would make Sea of Thieves more consistently fun and worth playing, but it will take a lot of work to get there. Right now it cannot be recommended for purchase at retail price; in case you’re already an Xbox Game Pass subscriber it’s well worth a try, but subscribing only due to Sea of Thieves would also be questionable right now.